Are you looking for a Chinese Acupuncturist in Dublin? Hi, I’m Malou (Xiao Chun Wang). I am a professional and confident Dublin-based Chinese acupuncturist with over 16 years of experience, both, in China and Ireland. Following three years nursing training, which involved studying Acupuncture, Tui Na massage and the use of Chinese herbs, I practiced as a Traditional Chinese Medicine nurse for many years in a hospital in Shanghai. I worked in the Department of Internal Diseases and the Department of Neurosurgery, where Western and Chinese Medicine are used in tandem in order to speed up patient’s recovery. To be able to practice acupuncture in Ireland, I underwent a further two-year study and gained a Diploma in Acupuncture from Shanghai Acupuncture College Ireland. In 2010, I have completed a Herbal course in an Acupuncture Foundation, after which I went back to Shanghai to practice healing with herbs in Gynaecology and Oncology departments in Yue Yang Hospital. I go back to hospitals in Shanghai on a regular basis to further deepen my knowledge in various areas of Traditional Chinese Medicine (TCM). I’m also a highly qualified TCM Tui Na medical massage therapist. I have worked with patients in St. John of God Hospital for two and a half years. I work on different meridians on patient’s back and head to relieve their physical and emotional stress. My special technique – acupuncture with shoulders, neck, and head massage has proven to be a great support through the program. 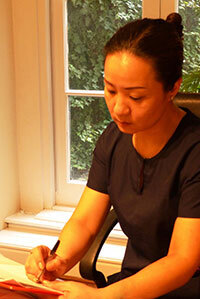 I have been practicing acupuncture and TCM at Malou Acupuncture Dublin since 12 years. I use acupuncture (including ear acupuncture and electro-acupuncture), cupping, moxibustion, Tui Na massage, hot stone therapy and acupuncture with head massage, depending on patient’s condition.